Astronomers studying a disk of material circling a still-forming star inside our Galaxy have found a tantalizing result -- the inner part of the disk is orbiting the protostar in the opposite direction from the outer part of the disk. "This is the first time anyone has seen anything like this, and it means that the process of forming planets from such disks is more complex than we previously expected," said Anthony Remijan, of the National Radio Astronomy Observatory, who with his colleague Jan M. Hollis, of the NASA Goddard Space Flight Center, used the National Science Foundation's Very Large Array radio telescope to make the discovery. "The solar system that likely will be formed around this star will include planets orbiting in different directions, unlike our own solar system in which all the planets orbit the Sun in the same direction," Hollis explained. 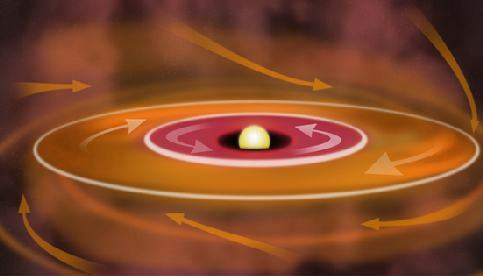 Stars and planets, scientists believe, are formed when giant clouds of gas and dust collapse. As the cloud collapses, a flattened, rotating disk of material develops around the young star. This disk provides the material from which planets form. The disk and the resulting planets rotate in the same direction as the original cloud, with the rotation speed increasing closer to the center, much as a spinning figure skater spins faster when they draw their arms inward. If all the material in the star and disk come from the same prestellar cloud, they all will rotate in the same direction. That is the case with our own solar system, in which the planets all orbit the Sun in the same direction as the Sun itself rotates on its axis. In the case of a young star some 500 light-years from Earth in the direction of the constellation Ophiuchus, Remijan and Hollis found the inner and outer parts of the disk rotating in opposite directions. "We think this system may have gotten material from two clouds instead of one, and the two were rotating in opposite directions," Remijan said. There is sufficient material to form planets from both parts of the disk, he added. The object is in a large, star-forming region where chaotic motions and eddies in the gas and dust result in smaller cloudlets that can rotate in different directions. In the solar system that probably will form around this young star, the innermost planets will orbit in one direction and the outer planets will orbit in the opposite direction. The scientists studied the star-forming clouds by analyzing radio waves emitted at specific, known frequencies by molecules within the clouds. Because the molecules emit radio waves at specific frequencies, shifts in those frequencies caused by motions (called Doppler Shift) can be measured, revealing the direction in which the gas is moving relative to Earth. The newest VLA observations of the region showed the motion of silicon monoxide (SiO) molecules, which emit radio waves at about 43 GigaHertz (GHz). When the astronomers compared their new VLA measurements of the motion of SiO molecules close to the young star with earlier measurements of other molecules farther away from the protostar, they realized the two were orbiting the star in opposite directions. Though this is the first time such a phenomenon has been seen in a disk around a young star, "Similar structures and dynamics commonly occur on small and large scales throughout the Universe. Thus, it is not surprising to find counter-rotation in a protostellar disk since the phenomenon has been previously reported in the disks of galaxies," Hollis said. The astronomers' report on their results will appear in the April 1 edition of the Astrophysical Journal.